THOMAS JEFFERSON. 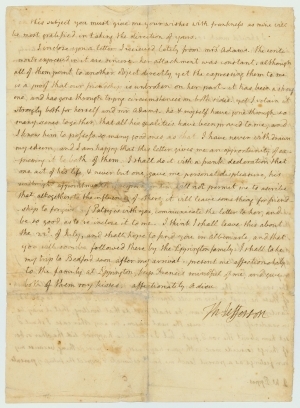 Autograph Letter Signed as President, to John W. Eppes, June 4, 1804, Washington D.C. 2 pp., 7¾ x 10 in. I should much sooner have written to you but for the press of business which had accumulated at my return, and which is not yet entirely got under. We lamented much that you had not staid a day longer at Monticello, as on the evening of your departure the Eppington family arrived, and it would have added much to our happiness to have been all together the 4 or 5 days that the weather detained me at home. We consented to consign little Maria to the entreaties of Mrs Eppes until August when she promised to bring her back herself. Nature’s laws will in time deprive her of all her older connections. It will then be a great comfort to have been brought up with those of her own age, as sisters & brothers of the same house, knowing each other in no other relation, and ready to become the parent of each other’s orphan children. While I live both the children will be to me the dearest of all pledges, and I shall consider it as increasing our misfortune should we have the less of your society. It will in no wise change my views at Pantops, and should considerations, which ought not to be opposed by me in the actual state of things, induce you to change the purpose of your residence at Pantops, I shall still do there what I had always proposed to you; expecting it will some day become the residence of Francis. I may only take more time for it after Lilly shall have done at the mill, which I suppose will be by the time of my return home, there are then three jobs for him, the leveling at Pantops, the road along the river, and the leveling the garden at Monticello. Which of these he first enters on will depend on your views. If they be to get to Pantops as soon as you can; he shall first do that levilling, that it may be in readiness to begin a house the next season. In any other case I should set him about the road first. But I should be happier did the other order of things coincide more with your happiness. But I press nothing, because my own feelings as a parent teach me how to estimate & respect the feelings of parents. This subject you must give me your wishes with frankness as mine will be most gratified in taking the direction of yours. I inclose you a letter I received lately from Mrs Adams. The sentiments expressed in it are sincere. Her attachment was constant. Although all of them point to another object directly, yet the expressing them to me is a proof that our friendship is unbroken on her part. It has been a strong one, and has gone through trying circumstances on both sides. Yet I retain it strongly both for herself and Mr Adams. He & myself have gone through so many scenes together, that all his qualities have been proved to me, and I know him to possess so many good ones, as that I have never withdrawn my esteem, and I am happy that this letter gives me an opportunity of expressing it to both of them. I shall do it with a frank declaration that one act of his life, & never but one, gave me personal displeasure, his midnight appointments. A respect for him will not permit me to ascribe that altogether to the influence of others, it will leave something for friendship to forgive; Patsy [Martha] is with you, communicate the letter to her, and be so good as to inclose it to me. I think I shall leave this about the 22d. of July, and shall hope to find you in Albemarle, and that you will soon be followed there by the Eppington family. I shall take my trip to Bedford soon after my arrival. Present me affectionately to the family at Eppington, keep Francis mindful of me, and give both of them my kisses. Affectionately adieu. 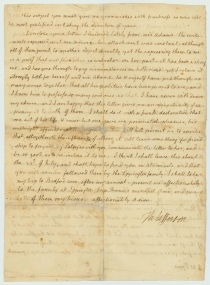 In this letter, Jefferson counsels his son-in-law on the upbringing of the now motherless infant, Maria, and assures him that he will remain part of his family. He demonstrates this by discussing the continuing renovations of Monticello and neighboring Pantops, to which John and Maria were destined to move before her death. Pantops had been Jefferson’s dowry to the couple on their wedding day in 1797. Abigail Adams had been a surrogate mother to Maria (“Polly”) Jefferson when the little girl stayed with the Adamses in London in the mid-1780s. Hearing of Polly’s death, Abigail wrote: “Reasons of various kinds withheld my pen” from writing Jefferson sooner, “until the powerful feelings of my heart have burst through the restraint, and called me to shed the tear of sorrow over the departed remains of your beloved and deserved daughter, an event which I most sincerely mourn.” But Jefferson was wrong to think that Abigail had changed her feelings towards him, and wrong in thinking that his frank admission about the midnight appointments would clear the air. They only provoked a scathing letter from Abigail, in which she decided to be frank about her resentments against Jefferson--and there was more than one. By the time their exchange of letters finished five months later, relations were as bad between Monticello and Quincy as they had been on midnight, March 3, 1801. The “midnight appointments,” to which Jefferson refers, were John Adams’s appointments of several dozen judgeships in his last hours of office upon departing the presidency in 1801. Jefferson and Secretary of State Madison chose not to deliver the commission of one such appointment, William Marbury, which had been accidentally misplaced. This commenced the famous case of Marbury v. Madison, where Chief Justice John Marshall, also an Adams appointee and an inveterate enemy of Jefferson, pronounced the doctrine of judicial review. Jefferson felt that Adams had spitefully named Federalists to these positions, where they could only be removed by impeachment, when he should have allowed them to remain vacant until he assumed the office. Thomas Jefferson (1743-1826) Author of the Declaration of Independence, governor of Virginia, secretary of state under George Washington, third president of the U.S., (1801-1809) and Founder of the University of Virginia. Under Jefferson, the country began its westward expansion with the Louisiana Purchase (1803) and the Lewis & Clark Expedition (1804-1806). John Wayles Eppes (1773-1823) was the son-in-law of Thomas Jefferson and a lawyer and politician. He served successively in the state House of Delegates, the House of Representatives (advancing to chair the Ways and Means Committee), and the U.S. Senate. Smith, Page. John Adams. New York, 1962. II: 1082-1085. Cappon, Lester, ed. 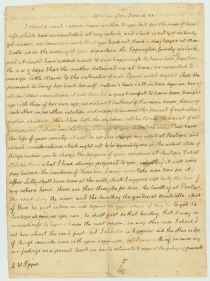 The Adams-Jefferson Letters. Chapel Hill, 1959.